SharePoint is increasingly used to store business-critical data and as a development platform for business-critical applications. A poorly functioning SharePoint environment increases the burden on your administrators and lowers the productivity of your users, causing significant impact to your business. Our SharePoint Health Check can highlight where your systems align with recommended best practices, and identify where your existing implementation is in alignment with your business needs. We can identify how you can increase operational efficiency, maximize system uptime, and reduce costs through examination of the most critical aspects of your SharePoint environment. Let our SharePoint experts evaluate your SharePoint Environment from top to bottom. 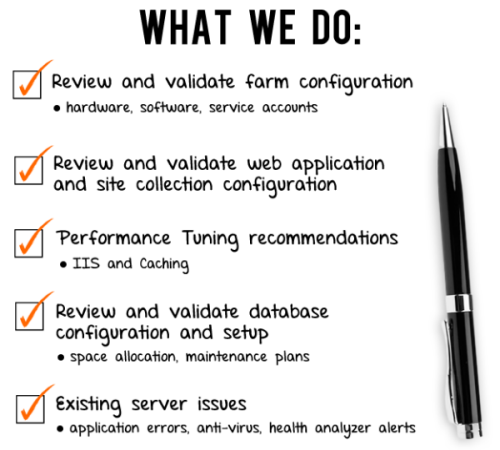 Our dedicated experts will review your web applications and site collection configurations, provide performance tuning recommendations, identify what specific SharePoint features are activated, check existing server issues -- and much more. Contact us today to schedule your SharePoint Health Check appointment! Our SharePoint Health Check can highlight where your systems align with recommended best practices, and identify where your existing implementation is in alignment with your business needs. We can identify how you can increase operational efficiency, maximize system uptime, and reduce costs through examination of the most critical aspects of your SharePoint environment. A Health Check helps expose vulnerabilities in your SharePoint infrastructure and operational processes. The health check reveals the causes of problems, not just the symptoms, helping you to take a proactive approach in addressing the problems. This proactive approach can help optimize productivity and uncover potential risks before they affect users and drive up support costs. A Health Check can address your key needs now, as well as your projected needs over the next few years. The SharePoint Health Check provides minimal intrusion to your IT systems, while gathering key data, and we have a strict policy of non-intervention throughout the Health Check. We will produce a report, analyzing the information/data gathered on site, and providing a summary of our findings. This report will include a description of the risks involved with the current implementation, and highlighting any problem areas. In addition, it will provide recommendations for the short term and longer term, to enhance and improve your business’ SharePoint experience. Deployment Configuration – architecture review, log review. Services – a look at which services have been implemented in the implementation, and how they are running. Sizing – coping with current and projected usage. Best Practices – Are you following Microsoft’s recommended best practices for SharePoint? We provide one or two experienced SharePoint consultants for a minimum of one day, depending on the size of your organization, and current SharePoint implementation, increasing the time on site proportionally. We will provide a set of recommendations to improve your SharePoint implementation; including any action that can help you reach your highest performance goals. In addition, we can provide recommendations to ensure that your environment is configured and managed properly to meet your business needs. Our Health Check provides practical solutions for each of the identified risks, to improve your enterprise deployment of Office SharePoint Server.